CARBONDALE, Ill. — What began as a foundational film production class assignment for Southern Illinois University Carbondale cinema student and filmmaker Kelechi Agwuncha is earning national recognition. Agwuncha’s film, “Super Predator: Preludes of the Black Fish” is one of 25 independent short films featured in the 2018 PBS Online Film Festival. The selection is the first entry for SIU and WSIU Public Broadcasting in the festival’s seven-year history. The 7-minute film is a “really poetic essay on African-American identity,” said Jennida Chase, an assistant professor in the Department of Cinema and Photography who was among those to critique Agwuncha’s film for Associate Professor Hong Zhou’s class. 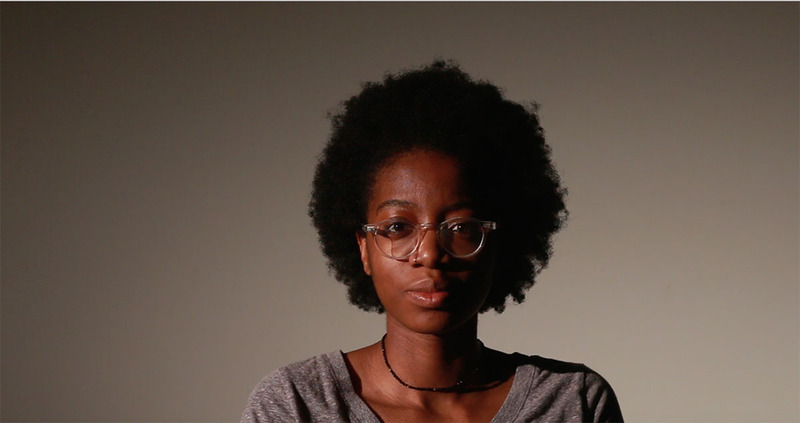 The film explores the realities that people-of-color face while navigating prejudice in society. Taz Wilson, a recent graduate from the Department of Theater, portrays the film’s protagonist “Blackfish,” while five other cinema and photography students are also involved with the film. Agwuncha, a cinema major from Westchester, said she has “immense love and gratefulness” at the nomination. The project took two days to shoot. Conceptualization involved piecing together cultural observations that took less than a week to place into a narrative. The film was also a recent finalist selection in the Toronto International Film Festival’s TIFFXInstagram Short Film Festival. Chase has never seen a foundational production class final project hit two major film festivals. Agwuncha said she hopes people who view the film want to learn more about the nature and history of the word “super predator.” The word has “strong ties and influences to the Violent Crime Control and Law Enforcement Act of 1994, which proved detrimental to law enforcement’s and the news’s treatment of people of color,” she said. Agwuncha plans to attend graduate school to pursue a Master of Fine Arts degree in cinema, and said would love to “immerse” herself in world cinema. Working with faculty and staff, WSIU selected several locally produced short films from a variety of genres for submission to PBS, Beth Spezia, WSIU educational outreach coordinator, said. She believes WSIU was chosen as a partner because of ongoing collaboration with the college to encourage emerging producers. SIU’s academic strength in creative industries and media arts, as well as opportunities to link with the Big Muddy Film Festival, resonated with the online film festival staff. Agwuncha was president of the 2018 Big Muddy Film Festival. “We’re thrilled to be a producing partner for the 2018 PBS Online Film Festival and to have this unique opportunity to showcase and highlight student talent on the SIU Carbondale campus,” Greg Petrowich, WSIU Public Broadcasting executive director, added. “Going beyond traditional broadcast, WSIU Public Television is proud to also play a role in the educational process by introducing students to opportunities such as this, which serve to expand the classroom experience and provide a platform to showcase their talent and abilities,” he said. A free local screening for the public is Monday from 5 to 7 p.m. at Carbondale Community Arts, 304 W. Walnut St., Carbondale. Additional festival entries will also be available for viewing. The event is an opportunity to encourage the audience to choose their favorite film during the July 17-27 festival voting period. Carbondale Community Arts will have a free kiosk accessible for the public to view festival films throughout the festival. Voting does not begin until Monday, but will also be accessible online at www.pbs.org/filmfestival. Simon Kilmurry - International Documentary Association, executive director. Mike Sargent – Black Film Critics Circle, founder. Judith Vecchione – WGBH Educational Foundation, executive producer. Chloe Walters-Wallace - Firelight Media & Films, documentary lab manager. Adnaan Wassey – digital media executive (formerly of POV). Pam Aguilar – PBS National Programming. Michelle Mizner – FRONTLINE, producer and editor. Eric Gulliver - American Experience, producer. H.D. Motyl, interim department chair, and Chase each said the ability to expand WSIU’s relationship to include cinema and photography is vital and exciting. “Super Predator: Preludes of the Black Fish” a film by Kelechi Agwuncha, is one of 25 entries in the 2018 PBS Online Film Festival. The selection is the first for SIU and WSIU Public Broadcasting in the festival’s seven-year history. Voting is July 17-27 online at www.pbs.org/filmfestival. Media Contacts: Beth Spezia, WSIU Educational Outreach Coordinator, 618/453-5595 or Katrina Stackhouse, WSIU Digital Services Manager, 618/453-6258.